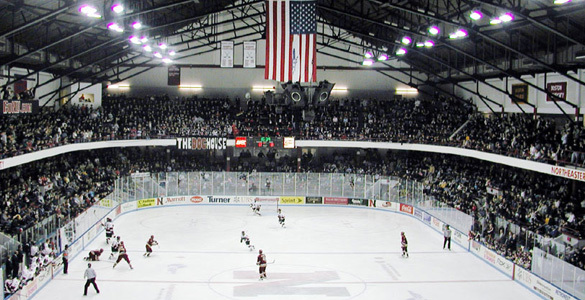 For the first time since 2008, the Northeastern Huskies went north up Interstate 95 to Orono, Maine and swept the Black Bears in conference play at Alfond Arena. 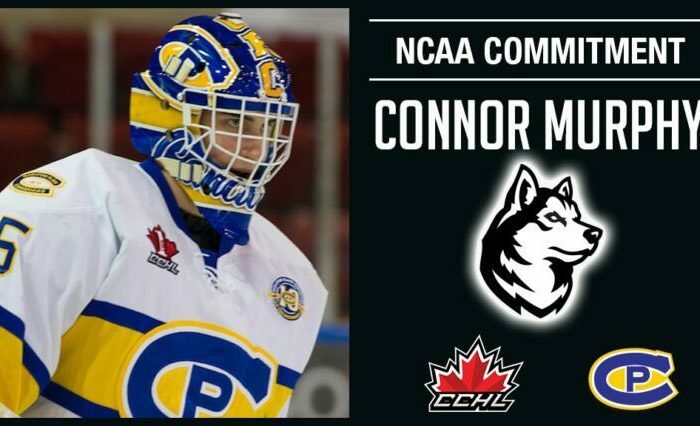 Goaltender Cayden Primeau saved 52 of 54 shots that he faced, including all 33 on Saturday night to earn his 7th shutout as a Husky, tying former netminder Keni Gibson for third all time in program history. Friday’s victory came by the score of 3-2, while the shutout was a 4-0 dominating effort by Northeastern. How good have the #HowlinHuskies been away from home this season? Friday– A three goal flurry within 6 minutes of first period game time was enough to propel the Huskies to a 3-2 win in the first game of this weekend set. Brandon Hawkins scored the first of three goals he would pot this weekend, a beautiful one-timer on the back doorstep of the goal. He had a wide-open net to score into after a great feed from Jeremy Davies as Davies skated down to the red line and pulled the defender with him. Patrick Schule would double the team’s lead less than four minutes later when he cleaned up the mess in front, banging home a rebound off of Tyler Madden’s initial shot. Madden had the puck on a string all weekend, dangling through Maine’s defense like they were pylons set up in practice. His ability to move the puck and keep it away from the defense is impeccable. Madden is named the second star of the game. He looks like a totally different player than he did before he left for World Juniors, which is impressive considering he was already one of the best freshmen in the country. Filipe first star. The third Huskies goal came on the powerplay, where the Huskies moved the puck at will both high and low around the goal, eventually getting it to Matt Filipe who was denied on his first shot, but stayed with it to knock the rebound home. That powerplay was actually a full five-minute major thanks to a headbutting penalty by Maine freshman Jacob Schmidt-Svejstrup, the first time any of us had seen a penalty called as such. Maine would get one goal back in each of the last two periods, but never really threatened the lead the Huskies were able to build. The first goal from Ryan Smith, which Primeau got the bottom half of his glove on before it went in, and the second was a scrum in front that led to Adam Dawe knocking the puck in for his first collegiate goal, a powerplay goal on the lone NU penalty of the night. Northeastern outshot Maine 42-21, which is far more indicative of how the game went than the final score. Saturday Night– In absolutely dominant fashion, the Huskies shut out the Black Bears 4-0 in their second night in the north, and our first trip as a blog to Alfond Arena. While they were outshot 33-29, Primeau stopped all pucks coming towards him on net, and the Huskies used another three goal outburst to power past a Maine team that seemed to care more about body checking than scoring goals most of the night. A scoreless first period was fairly even, with the Maine having the edge in shots 10-9, but neither team really coming close to breaking through. 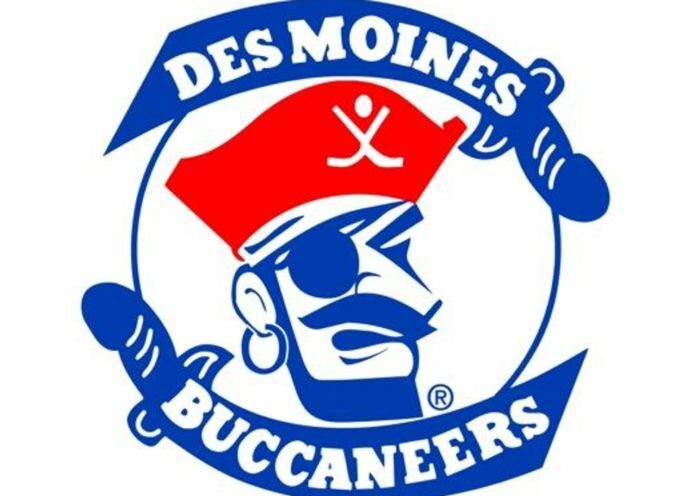 The second period started off with a bang, as a loose puck at the Maine blue line went untouched by the surrounding six or seven skaters as they all expected an offsides whistle, until Zach Solow scooped it up and fired it through the arms of an unprepared Jeremy Swayman and into the net. The play was reviewed for offsides but the call on the ice stood, much to the chagrin of the home crowd. In a microcosm of the season for both teams, the Huskies played until a whistle was heard, whereas Maine had a lapse in judgment leading to the 1-0 Huskies lead. Soon after, Northeastern converted a textbook 3-on-2 rush that ended with a Julian Kislin feed to Liam Pecararo, who roofed the puck over Swayman, off the crossbar and in. We have to imagine after playing for Maine in his first NCAA stint and then being in academic purgatory after leaving, it much have felt good for the senior to score against his former team. A Maine penalty shortly thereafter put the Huskies on the powerplay, but not for long as only five seconds after winning the faceoff, Brandon Hawkins buried an absolute bomb into the corner of the net, giving the Huskies a 3-0 lead and Hawkins a 2-goal weekend. Hawkins would go on to add another goal from in close in the third period off of a lovely feed from the corner via Lincoln Griffin. Maine had some chances in the third period to break through onto the scoreboard but Primeau stood tall to turn away every chance, including a breakaway chance in the middle of the third. The end of the game was marred with an ugly injury suffered by Maine freshman Adam Dawe, who was caught by a Brandon Hawkins hit in open ice across the slot after he delivered a shot. Dawe lay motionless on the ice for several minutes before being helped to the locker room by the Maine captains, Hawkins was issued a five minute major penalty and game misconduct, and the crowd was very animated in voicing their displeasure with both the Huskies team on the ice and the six Huskies fans in the stands (including some nasty things said towards the three of us…). In the video below, we see the hit and believe that while it’s a big hit, there was no intention of Hawkins to hit Dawe in the head or cause injury; unfortunately tempers were boiling all night as the score got worse and worse, and Dawe’s injury was the straw that broke the collective backs of the Maine team and Maine faithful. The final 45 seconds of the game were physical, with boos pouring onto the ice from the crowd, and lots of slashing, checking, and jawing at each other by the players. To their credit, both coaches made their teams line up for the postgame handshake, but naturally Maine had to ruin that too, as Maine backup goalie and former favorite sieve of Northeastern forwards Rob McGovern went after Biagio Lerario seemingly unprovoked in the handshake line. Lerario has a reputation for drawing the ire of former players and generating retaliation from opponents, but I’ve never seen a handshake line break down like this. Madigan ordered his troops to go to the locker room without finishing the handshake line, and they exited the ice to another round of boos and jeers from a Maine crowd more annoyed at Northeastern winning and injuring one of their own than they were about the dumpster fire decked out in blue and white jerseys in front of them. As of this writing, no further punishment has come out from Hockey East for either Hawkins or McGovern, and we are not expecting either to be disciplined further. 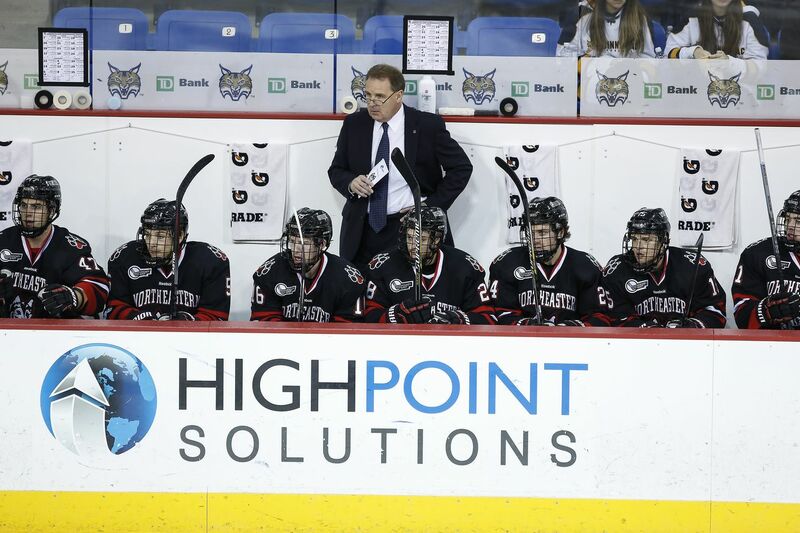 Final Thoughts– This was a weekend the Huskies desperately needed after having a bit of an offensive funk against RPI, Huntsville, and Merrimack. Cayden Primeau continued his stellar play this season and showed that his time away from Boston for World Juniors did not dull his abilities one bit, and Brandon Hawkins appears to be heating up as he moves into the final semester of his collegiate career, chasing both a pro contract on the other end of it and 100 career points (93 points currently, 58 at Bowling Green before transferring). A sweep in Hockey East is always tough, let alone one up in Orono, where Maine has had so much success historically. The Huskies have moved to 8th in the Pairwise, a comfortable position to be in right now. They also were 8th in the USCHO and USA Today Polls, and will get prepared this week to play the team that has been the story of the season, the UMass Minutemen. UMass sits first in both polls and the Pairwise ranking. We will be driving to the Mullins Center on Friday and will be at Matthews Saturday, and will have a preview later in the week.